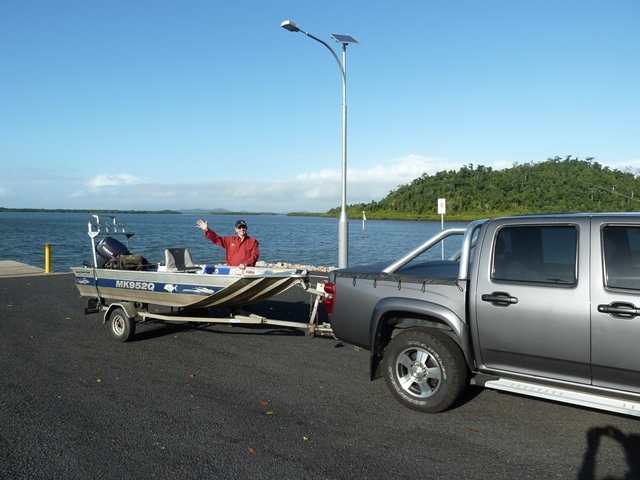 Located almost 2 hours drive south of Cairns, Mourilyan Harbour offers another tidal estuary alternative. This system is similar to Trinity Inlet in that it does not have any major river flowing into it and therefore can be productive during wet weather. Mourilyan however is a fairly windy place and can be blown out in bad weather. The narrow launch ramp faces directly into the prevailing winds which funnel menacingly through the narrow cliff like opening to the ocean, and chops up rather badly. This narrow opening also seems to accentuate any tidal movement and small slow moving tides are more productive here. 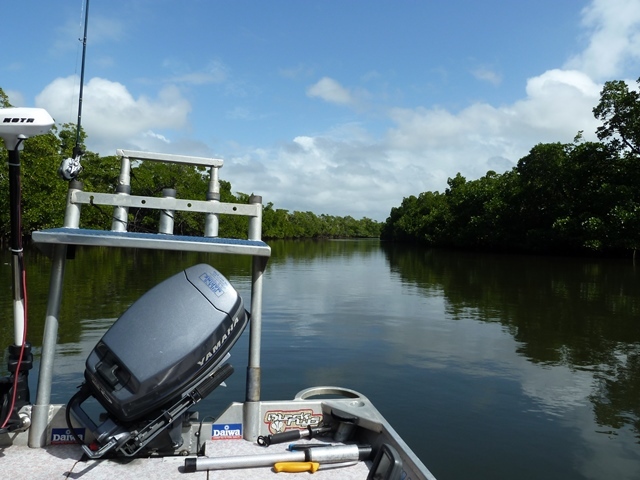 The system is quite large with many mangrove lined channels and creeks, sand bars and shale bottom areas. It is not an area for the reckless boatie and caution should be undertaken until you become familiar with this system. Some of the side creeks, and the upper reaches of the main Mourilyan Creek, are protected areas and no fishing is allowed. Look for the signs posted along the mangrove edges which mark the boundaries of these ‘no go’ areas. During the summer months excellent catches of prime Barramundi can be taken on lures cast around the mangrove roots, back eddies and small islands. The bottom of the tide is best. This system is also ‘Jack Heaven’, and when firing produces more Jacks per cast than any local waterway. 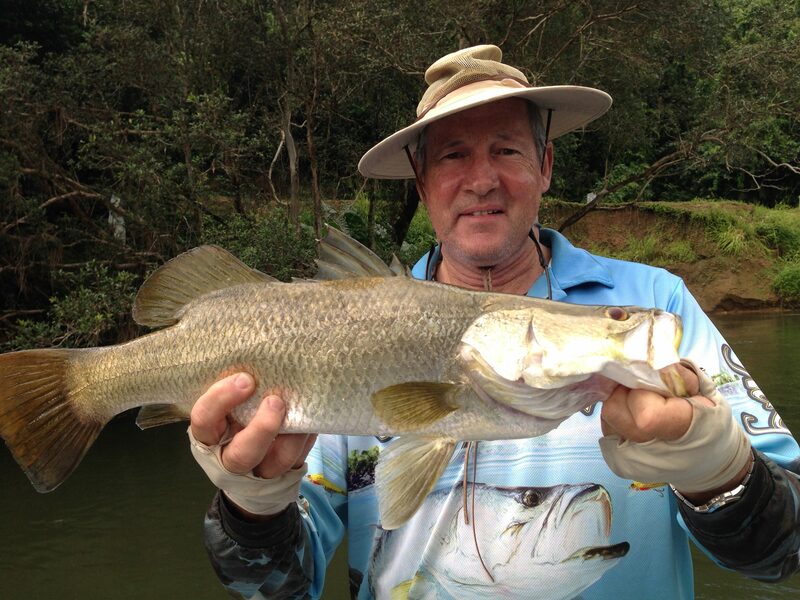 Deep diving lures work best, cast along the channels and parallel to the steep banks. On the rising tides follow the water over the sand flats casting around the structure. GT’s and Queenfish patrol the edges and gutters and are more productive during the cooler months. Lure fishing with 6 inch minnows, poppers and fizzers, and standard bait fishing techniques will all produce. The normal range of tropical species are also available including Grunter, Flathead, Cod, Bream, Barracuda and Salmon. Big Fingermark come from the deep rocky entrance channel on the slow moving tides and respond well to live sards and strip baits fished on dropper rigs.